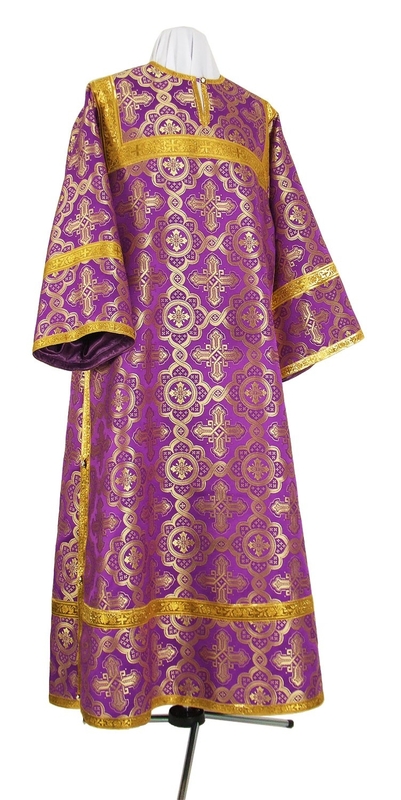 Orthodox Church liturgical Clergy stikharions (albs) (violet-gold) by Istok Church Supplies Corp.
No matter what your position is in the Orthodox Christian hierarchy, we have the perfect clergy stikharions. Highlight the mood of repentance and enhance liturgical worship during Lent with our high quality violet-gold clergy stikharions - you won’t find better value anywhere else on the internet! Our violet-gold clergy stikharions are in the traditional open-sides style as is required for tonsured persons. They are made from lovely ecclesiastical fabrics such as rayon brocade, metallic brocade and natural German velvet. Whether you choose the cost-effectiveness of rayon brocade, the grand allure of metallic brocade or the simple elegance of natural German velvet, you can count on the fabric being comfortable and long-lasting. To ensure our violet-gold clergy stikharions deliver many years of service, we provide pure natural rayon lining. We understand customers who visit our online store have diverse requirements, budgets and aesthetic preferences. Hence, we offer plenty of options for customizing orders. For example, customers can add natural velvet inserts to their order and select from three decoration types. Our clergy stikharion decorations include applique crosses and galloons. To help customers make best choices, we provide high quality images with each product and useful information such as weight, SKU number and care instructions. Every clergy member deserves to have a stikharion that fits perfectly. We are more than happy to offer made-to-measure service. Customers can provide us with their precise measurements and our religious tailors in Europe will execute each order with excellent craftsmanship and attention to detail. We suggest you place your order at the earliest because we require a few short weeks to complete each order. Alternately, you can avail of our rush services that are available with applicable fees to receive your order early. We have proud to be trusted by hundreds of customers all over the world – we hope you like our collection and join our family of satisfied customers!